In her It Takes 4 To Tango DVD, Candy will take you through a brilliant exploration of behavioral styles that will make you think, laugh, even dance…and recognize your true self and others. You’ll also learn to overcome personality differences that lead to problems like communication breakdown, negotiation letdown, and delegation fall-down by learning the secrets to connecting and partnering with other personality styles. Have you ever had someone know just what buttons to push! We all have….and that’s why Candy loves to teach folks how to get their emotions under control. 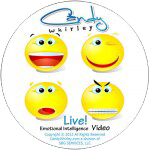 In this live DVD, you will laugh and learn about your emotions. You will analyze your emotions by exploring what aggravates you by knowing exactly what tics you off! Then we will discuss how to manage the obstacles so you can choose your emotions by being proactive NOT reactive, so you will have a clear head to recognize the emotions in people who are not like you! This interactive, energetic and entertaining live presentation will enable you to recruit, manage and work with people by learning the differences between generations X, Y, Boomers, and Matures, and their work habits and goals. Candy also shares her knowledge of gender differences in order to help participants understand that there is truly a difference in communication and conflict management. Those who have experienced Candy know her presentation would not be the same without one of her famous activities! You will see it LIVE! A 20-minute guided meditation designed to bring you peace of mind, body and soul. At the completion of your journey you will be relaxed, refreshed, re-energized and ready to take on the world!